I think my new hydrangea is dead! Help. I received my first ever hydrangea 2 weeks ago as a birthday gift and I think I've killed it. I re-potted it the day after I received it (it had one bloom growing) and a few days later, I had about 4-5 blooms appearing. I was so happy! I live in VA and it's very hot here right now, so I put it in the best (and most shaded place) I could think of (morning sun, afternoon shade) and watered it regularly (once a day in the evening when it had wilted a little from the sun). It would perk right back up come morning and continued to grow. 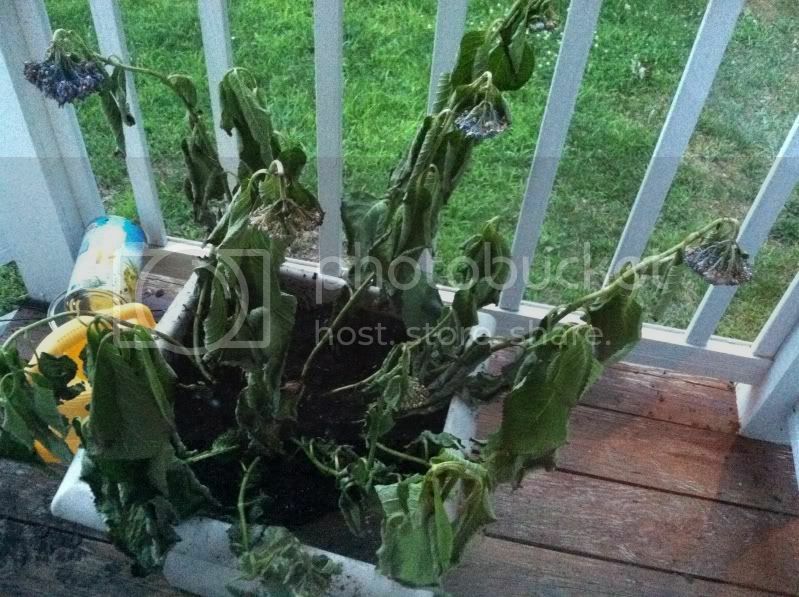 After a week, it was wilting even more. A couple of days ago (making it almost 3 weeks of owning the plant), it looked like (and still looks like) dried spinach and dead. HELP ME. We had a large storm last week, which I think may have flooded the hydrangea. Could it have root rot? Should I leave it alone? Re-pot it again? Call it quits and go buy a new one? The pictures below are only 1 week apart. It appears to me that it is root rot. Although Hydrangeas like their soil moist, too much water will cause root rot. Watering it every day is excessive. It is normal for the leaves to wilt during hot summer days, however they usually perk up in the evening and stay perked throughout the night, until morning. Another cause could be transplant shock. 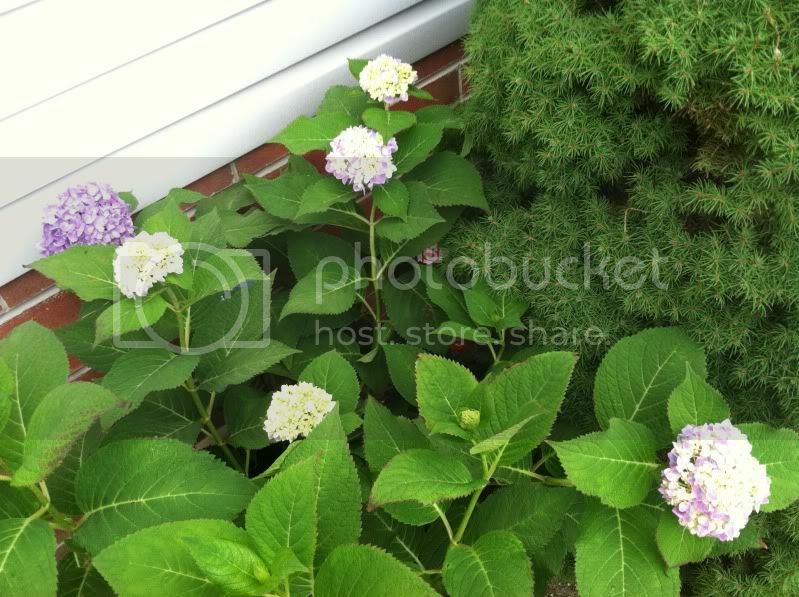 Also, do you know if this was a store bought Hydrangea or from a plant nursery? Store bought (grocery stores, etc..) are usually hot house grown and need to be acclimated to outside temps very slow. Here is a link that you may find helpful. Hope this helps you out somewhat. I think it was purchased from Lowes. I re-potted it the other day and haven't watered it since (I'm leaning towards root rot too), but there is no increase or decrease in the look of the plant. The new soil has gone dry, but I know that the root was soaked when I re-potted it, so I have left it be. I'm reading through the link you sent, but will it get better? Is there any hope?! I'm afraid once root rot takes place there is no hope for the plant; however I'm not quite sure about that since I'm fairly new to Hydrangeas (second season). Hopefully someone with more Hydrangea experience will read the thread and be able to provide some help. I overwatered this same hydrangea in 2010. I thought it was dead and ignored it in Fall. I was shocked to see that in Spring there were new leaves. Maybe you should leave it in the ground and see what happens. In 2010 it developed anthracnose and again this year. Help, is my new hydrangea dead? My dry, "dead" hydrangea is growing? ?